"Wave cyclone" redirects here. It is not to be confused with Tropical wave. Extratropical cyclones, sometimes called mid-latitude cyclones or wave cyclones, are low-pressure areas which, along with the anticyclones of high-pressure areas, drive the weather over much of the Earth. Extratropical cyclones are capable of producing anything from cloudiness and mild showers to heavy gales, thunderstorms, blizzards, and tornadoes. These types of cyclones are defined as large scale (synoptic) low pressure weather systems that occur in the middle latitudes of the Earth. In contrast with tropical cyclones, extratropical cyclones produce rapid changes in temperature and dew point along broad lines, called weather fronts, about the center of the cyclone. This animation shows an extratropical cyclone developing over the United States, starting late on October 25 and running through October 27, 2010. The term "cyclone" applies to numerous types of low pressure areas, one of which is the extratropical cyclone. The descriptor extratropical signifies that this type of cyclone generally occurs outside the tropics and in the middle latitudes of Earth between 30° and 60° latitude. They are termed mid-latitude cyclones if they form within those latitudes, or post-tropical cyclones if a tropical cyclone has intruded into the mid latitudes. Weather forecasters and the general public often describe them simply as "depressions" or "lows". Terms like frontal cyclone, frontal depression, frontal low, extratropical low, non-tropical low and hybrid low are often used as well. Extratropical cyclones are classified mainly as baroclinic, because they form along zones of temperature and dewpoint gradient known as frontal zones. They can become barotropic late in their life cycle, when the distribution of heat around the cyclone becomes fairly uniform with its radius. An upper level jet streak. DIV areas are regions of divergence aloft, which will lead to surface convergence and aid cyclogenesis. Extratropical cyclones form anywhere within the extratropical regions of the Earth (usually between 30° and 60° latitude from the equator), either through cyclogenesis or extratropical transition. A study of extratropical cyclones in the Southern Hemisphere shows that between the 30th and 70th parallels, there are an average of 37 cyclones in existence during any 6-hour period. A separate study in the Northern Hemisphere suggests that approximately 234 significant extratropical cyclones form each winter. Extratropical cyclones form along linear bands of temperature/dewpoint gradient with significant vertical wind shear, and are thus classified as baroclinic cyclones. Initially, cyclogenesis, or low pressure formation, occurs along frontal zones near a favorable quadrant of a maximum in the upper level jetstream known as a jet streak. The favorable quadrants are usually at the right rear and left front quadrants, where divergence ensues. The divergence causes air to rush out from the top of the air column. As mass in the column is reduced, atmospheric pressure at surface level (the weight of the air column) is reduced. The lowered pressure strengthens the cyclone (a low pressure system). The lowered pressure acts to draw in air, creating convergence in the low-level wind field. Low-level convergence and upper-level divergence imply upward motion within the column, making cyclones tend to be cloudy. As the cyclone strengthens, the cold front sweeps towards the equator and moves around the back of the cyclone. Meanwhile, its associated warm front progresses more slowly, as the cooler air ahead of the system is denser, and therefore more difficult to dislodge. Later, the cyclones occlude as the poleward portion of the cold front overtakes a section of the warm front, forcing a tongue, or trowal, of warm air aloft. Eventually, the cyclone will become barotropically cold and begin to weaken. Atmospheric pressure can fall very rapidly when there are strong upper level forces on the system. When pressures fall more than 1 millibar (0.030 inHg) per hour, the process is called explosive cyclogenesis, and the cyclone can be described as a (weather) bomb. These bombs rapidly drop in pressure to below 980 millibars (28.94 inHg) under favorable conditions such as near a natural temperature gradient like the Gulf Stream, or at a preferred quadrant of an upper level jet streak, where upper level divergence is best. The stronger the upper level divergence over the cyclone, the deeper the cyclone can become. Hurricane-force extratropical cyclones are most likely to form in the northern Atlantic and northern Pacific oceans in the months of December and January. 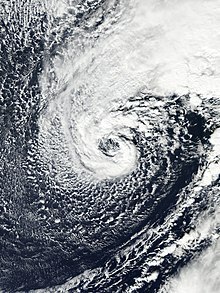 On 14 and 15 December 1986, an extratropical cyclone near Iceland deepened to below 920 hectopascals (27 inHg), which is a pressure equivalent to a category 5 hurricane. In the Arctic, the average pressure for cyclones is 980 millibars (28.94 inHg) during the winter, and 1,000 millibars (29.53 inHg) during the summer. Tropical cyclones often transform into extratropical cyclones at the end of their tropical existence, usually between 30° and 40° latitude, where there is sufficient forcing from upper-level troughs or shortwaves riding the Westerlies for the process of extratropical transition to begin. During this process, a cyclone in extratropical transition (known across the eastern North Pacific and North Atlantic oceans as the post-tropical stage), will invariably form or connect with nearby fronts and/or troughs consistent with a baroclinic system. Due to this, the size of the system will usually appear to increase, while the core weakens. However, after transition is complete, the storm may re-strengthen due to baroclinic energy, depending on the environmental conditions surrounding the system. The cyclone will also distort in shape, becoming less symmetric with time. During extratropical transition, the cyclone begins to tilt back into the colder airmass with height, and the cyclone's primary energy source converts from the release of latent heat from condensation (from thunderstorms near the center) to baroclinic processes. The low pressure system eventually loses its warm core and becomes a cold-core system. The peak time of subtropical cyclogenesis (the midpoint of this transition) in the North Atlantic is in the months of September and October, when the difference between the temperature of the air aloft and the sea surface temperature is the greatest, leading to the greatest potential for instability. On rare occasions, an extratropical cyclone can transit into a tropical cyclone if it reaches an area of ocean with warmer waters and an environment with less vertical wind shear. An example of this happening is in the 1991 Perfect Storm. The process known as "tropical transition" involves the usually slow development of an extratropically cold core vortex into a tropical cyclone. The Joint Typhoon Warning Center uses the extratropical transition (XT) technique to subjectively estimate the intensity of tropical cyclones becoming extratropical based on visible and infrared satellite imagery. Loss of central convection in transitioning tropical cyclones can cause the Dvorak technique to fail; the loss of convection results in unrealistically low estimates using the Dvorak technique. The system combines aspects of the Dvorak technique, used for estimating tropical cyclone intensity, and the Hebert-Poteat technique, used for estimating subtropical cyclone intensity. The technique is applied when a tropical cyclone interacts with a frontal boundary or loses its central convection while maintaining its forward speed or accelerating. The XT scale corresponds to the Dvorak scale and is applied in the same way, except that "XT" is used instead of "T" to indicate that the system is undergoing extratropical transition. Also, the XT technique is only used once extratropical transition begins; the Dvorak technique is still used if the system begins dissipating without transition. Once the cyclone has completed transition and become cold-core, the technique is no longer used. QuikSCAT image of typical extratropical cyclones over the ocean. Note the maximum winds are on the outside of the occlusion. The windfield of an extratropical cyclone constricts with distance in relation to surface level pressure, with the lowest pressure being found near the center, and the highest winds typically just on the cold/poleward side of warm fronts, occlusions, and cold fronts, where the pressure gradient force is highest. The area poleward and west of the cold and warm fronts connected to extratropical cyclones is known as the cold sector, while the area equatorward and east of its associated cold and warm fronts is known as the warm sector. The wind flow around an extratropical cyclone is counterclockwise in the northern hemisphere, and clockwise in the southern hemisphere, due to the Coriolis effect (this manner of rotation is generally referred to as cyclonic). Near this center, the pressure gradient force (from the pressure at the center of the cyclone compared to the pressure outside the cyclone) and the Coriolis force must be in an approximate balance for the cyclone to avoid collapsing in on itself as a result of the difference in pressure. The central pressure of the cyclone will lower with increasing maturity, while outside of the cyclone, the sea-level pressure is about average. In most extratropical cyclones, the part of the cold front ahead of the cyclone will develop into a warm front, giving the frontal zone (as drawn on surface weather maps) a wave-like shape. Due to their appearance on satellite images, extratropical cyclones can also be referred to as frontal waves early in their life cycle. In the United States, an old name for such a system is "warm wave". In the northern hemisphere, once a cyclone occludes, a trough of warm air aloft—or "trowal" for short—will be caused by strong southerly winds on its eastern periphery rotating aloft around its northeast, and ultimately into its northwestern periphery (also known as the warm conveyor belt), forcing a surface trough to continue into the cold sector on a similar curve to the occluded front. The trowal creates the portion of an occluded cyclone known as its comma head, due to the comma-like shape of the mid-tropospheric cloudiness that accompanies the feature. It can also be the focus of locally heavy precipitation, with thunderstorms possible if the atmosphere along the trowal is unstable enough for convection. Extratropical cyclones slant back into colder air masses and strengthen with height, sometimes exceeding 30,000 feet (approximately 9 km) in depth. Above the surface of the earth, the air temperature near the center of the cyclone is increasingly colder than the surrounding environment. These characteristics are the direct opposite of those found in their counterparts, tropical cyclones; thus, they are sometimes called "cold-core lows". Various charts can be examined to check the characteristics of a cold-core system with height, such as the 700 millibars (20.67 inHg) chart, which is at about 10,000 feet (3,048 meters) altitude. Cyclone phase diagrams are used to tell whether a cyclone is tropical, subtropical, or extratropical. There are two models of cyclone development and lifecycles in common use—the Norwegian model and the Shapiro-Keyser Model. Of the two theories on extratropical cyclone structure and life cycle, the older is the Norwegian Cyclone Model, developed during World War I. In this theory, cyclones develop as they move up and along a frontal boundary, eventually occluding and reaching a barotropically cold environment. It was developed completely from surface-based weather observations, including descriptions of clouds found near frontal boundaries. This theory still retains merit, as it is a good description for extratropical cyclones over continental landmasses. A second competing theory for extratropical cyclone development over the oceans is the Shapiro-Keyser model, developed in 1990. Its main differences with the Norwegian Cyclone Model are the fracture of the cold front, treating warm-type occlusions and warm fronts as the same, and allowing the cold front to progress through the warm sector perpendicular to the warm front. This model was based on oceanic cyclones and their frontal structure, as seen in surface observations and in previous projects which used aircraft to determine the vertical structure of fronts across the northwest Atlantic. A warm seclusion is the mature phase of the extratropical cyclone lifecycle. This was conceptualized after the ERICA field experiment of the late 1980s, which produced observations of intense marine cyclones that indicated an anomalously warm low-level thermal structure, secluded (or surrounded) by a bent-back warm front and a coincident chevron-shaped band of intense surface winds. The Norwegian Cyclone Model, as developed by the Bergen School of Meteorology, largely observed cyclones at the tail end of their lifecycle and used the term occlusion to identify the decaying stages. Warm seclusions may have cloud-free, eye-like features at their center (reminiscent of tropical cyclones), significant pressure falls, hurricane-force winds, and moderate to strong convection. The most intense warm seclusions often attain pressures less than 950 millibars (28.05 inHg) with a definitive lower to mid-level warm core structure. A warm seclusion, the result of a baroclinic lifecycle, occurs at latitudes well poleward of the tropics. As latent heat flux releases are important for their development and intensification, most warm seclusion events occur over the oceans; they may impact coastal nations with hurricane force winds and torrential rain. Climatologically, the Northern Hemisphere sees warm seclusions during the cold season months, while the Southern Hemisphere may see a strong cyclone event such as this during all times of the year. In all tropical basins, except the Northern Indian Ocean, the extratropical transition of a tropical cyclone may result in reintensification into a warm seclusion. For example, Hurricane Maria of 2005 reintensified into a strong baroclinic system and achieved warm seclusion status at maturity (or lowest pressure). A February 24, 2007 radar image of a large extratropical cyclonic storm system at its peak over the central United States. Extratropical cyclones are generally driven, or "steered", by deep westerly winds in a general west to east motion across both the Northern and Southern hemispheres of the Earth. This general motion of atmospheric flow is known as "zonal". Where this general trend is the main steering influence of an extratropical cyclone, it is known as a "zonal flow regime". When the general flow pattern buckles from a zonal pattern to the meridional pattern, a slower movement in a north or southward direction is more likely. Meridional flow patterns feature strong, amplified troughs and ridges, generally with more northerly and southerly flow. Changes in direction of this nature are most commonly observed as a result of a cyclone's interaction with other low pressure systems, troughs, ridges, or with anticyclones. A strong and stationary anticyclone can effectively block the path of an extratropical cyclone. Such blocking patterns are quite normal, and will generally result in a weakening of the cyclone, the weakening of the anticyclone, a diversion of the cyclone towards the anticyclone's periphery, or a combination of all three to some extent depending on the precise conditions. It is also common for an extratropical cyclone to strengthen as the blocking anticyclone or ridge weakens in these circumstances. Where an extratropical cyclone encounters another extratropical cyclone (or almost any other kind of cyclonic vortex in the atmosphere), the two may combine to become a binary cyclone, where the vortices of the two cyclones rotate around each other (known as the "Fujiwhara effect"). This most often results in a merging of the two low pressure systems into a single extratropical cyclone, or can less commonly result in a mere change of direction of either one or both of the cyclones. The precise results of such interactions depend on factors such as the size of the two cyclones, their strength, their distance from each other, and the prevailing atmospheric conditions around them. Extratropical cyclones can bring mild weather with a little rain and surface winds of 15–30 km/h (9.3–18.6 mph), or they can be cold and dangerous with torrential rain and winds exceeding 119 km/h (74 mph), (sometimes referred to as windstorms in Europe). The band of precipitation that is associated with the warm front is often extensive. In mature extratropical cyclones, an area known as the comma head on the northwest periphery of the surface low can be a region of heavy precipitation, frequent thunderstorms, and thundersnows. Cyclones tend to move along a predictable path at a moderate rate of progress. During fall, winter, and spring, the atmosphere over continents can be cold enough through the depth of the troposphere to cause snowfall. Squall lines, or solid bands of strong thunderstorms, can form ahead of cold fronts and lee troughs due to the presence of significant atmospheric moisture and strong upper level divergence, leading to hail and high winds. When significant directional wind shear exists in the atmosphere ahead of a cold front in the presence of a strong upper level jet stream, tornado formation is possible. Although tornadoes can form anywhere on Earth, the greatest number occur in the Great Plains in the United States, because downsloped winds off the north-south oriented Rocky Mountains, which can form a dryline, aid their development at any strength. Explosive development of extratropical cyclones can be sudden. The storm known in the UK as the "Great Storm of 1987" deepened to 953 millibars (28.14 inHg) with a highest recorded wind of 220 km/h (140 mph), resulting in the loss of 19 lives, 15 million trees, widespread damage to homes and an estimated economic cost of £1.2 billion (US$2.3 billion). Although most tropical cyclones that become extratropical quickly dissipate or are absorbed by another weather system, they can still retain winds of hurricane or gale force. In 1954, Hurricane Hazel became extratropical over North Carolina as a strong Category 3 storm. The Columbus Day Storm of 1962, which evolved from the remains of Typhoon Freda, caused heavy damage in Oregon and Washington, with widespread damage equivalent to at least a Category 3. In 2005, Hurricane Wilma began to lose tropical characteristics while still sporting Category 3-force winds (and became fully extratropical as a Category 1 storm). In summer, extratropical cyclones are generally weak, but some of the systems can cause significant floods overland because of torrential rainfall. The July 2016 North China cyclone never brought gale-force sustained winds, but it caused devastating floods in mainland China, resulting in at least 184 deaths and ¥33.19 billion (US$4.96 billion) of damage. In the classic analysis by Edward Lorenz (the Lorenz energy cycle), extratropical cyclones (so-called atmospheric transients) acts as a mechanism in converting potential energy that is created by pole to equator temperature gradients to eddy kinetic energy. In the process, the pole-equator temperature gradient is reduced (i.e. energy is transported poleward to warm up the higher latitudes). The existence of such transients are also closely related to the formation of the Icelandic and Aleutian Low — the two most prominent general circulation features in the mid- to sub-polar northern latitudes. The two lows are formed by both the transport of kinetic energy and the latent heating (the energy released when water phase changed from vapor to liquid during precipitation) from the extratropical cyclones. Cyclone Oratia showing the comma shape typical of extratropical cyclones, over Europe in October 2000. A violent storm during the Crimean War on November 14, 1854, wrecked 30 vessels, and sparked initial investigations into meteorology and forecasting in Europe. In the United States, the Columbus Day Storm of 1962, one of many Pacific Northwest windstorms, led to Oregon's lowest measured pressure of 965.5 hPa (96.55 kPa; 28.51 inHg), violent winds, and US$170 million in damage (1964 dollars). The "Wahine storm" was an extratropical cyclone that struck Wellington, New Zealand on April 10, 1968, so named after causing the inter-island ferry TEV Wahine to strike a reef and founder at the entrance to Wellington Harbour, resulting in 53 deaths. On November 10, 1975, an extratropical storm on Lake Superior contributed to the sinking of the SS Edmund Fitzgerald near the Canada–US border, 15 NM northwest of the entrance to Whitefish Bay. A rapidly strengthening storm struck Vancouver Island on October 11, 1984, and inspired the development of moored buoys off the western coast of Canada. The Braer Storm of January 1993 was the strongest extratropical cyclone known to occur across the northern Atlantic Ocean, with a central pressure of 914 millibars (27.0 inHg). In 2012, Hurricane Sandy transitioned to a post-tropical cyclone on the night of October 29; a few minutes later it made landfall on the New Jersey coast as an extratropical storm with winds similar to a Category 1 hurricane and a wind field of over 1,150 miles (1,850 km). In the Southern Hemisphere, a violent extratropical storm hit Uruguay on August 23–24, 2005, killing 10 people. The system's winds exceeded 100 mph (160 km/h) while Montevideo, the country's capital with 1.5 million inhabitants, was affected by tropical storm-force winds for over 12 hours and by hurricane-force winds for nearly four hours. Peak gusts were registered at Carrasco International Airport as 107 mph (172 km/h) and at the Harbour of Montevideo as 116 mph (187 km/h). The lowest reported pressure was 991.7 hPa (99.17 kPa; 29.28 inHg). Extratropical cyclones are common in this part of the globe during fall, winter and spring months. The winds usually peak to 80–110 km/h (50–68 mph), and winds of 116 mph (187 km/h) are very uncommon. ^ a b DeCaria (2005-12-07). "ESCI 241 – Meteorology; Lesson 16 – Extratropical Cyclones". Department of Earth Sciences, Millersville University. Archived from the original on 2008-02-08. Retrieved 2009-06-21. ^ Ryan N. Maue (2004-12-07). "Chapter 3: Cyclone Paradigms and Extratropical Transition Conceptualizations". Archived from the original on 2008-05-10. Retrieved 2008-06-15. ^ Ian Simmonds; Kevin Keay (February 2000). "Variability of Southern Hemisphere Extratropical Cyclone Behavior, 1958–97". Journal of Climate. 13 (3): 550–561. Bibcode:2000JCli...13..550S. doi:10.1175/1520-0442(2000)013<0550:VOSHEC>2.0.CO;2. ISSN 1520-0442. ^ S. K. Gulev; O. Zolina; S. Grigoriev (2001). "Winter Storms in the Northern Hemisphere (1958–1999)". Climate Dynamics. 17 (10): 795–809. Bibcode:2001ClDy...17..795G. doi:10.1007/s003820000145. ^ Carlyle H. Wash; Stacey H. Heikkinen; Chi-Sann Liou; Wendell A. Nuss (February 1990). "A Rapid Cyclogenesis Event during GALE IOP 9". Monthly Weather Review. 118 (2): 234–257. Bibcode:1990MWRv..118..375W. doi:10.1175/1520-0493(1990)118<0375:ARCEDG>2.0.CO;2. ISSN 1520-0493. Retrieved 2008-06-28. ^ Jack Williams (2005-05-20). "Bomb cyclones ravage northwestern Atlantic". USA Today. Retrieved 2006-10-04. ^ Glossary of Meteorology (June 2000). "Bomb". American Meteorological Society. Retrieved 2009-06-21. ^ Frederick Sanders; John R. Gyakum (October 1980). "Synoptic-Dynamic Climatology of the "Bomb"". Monthly Weather Review. 108 (10). ^ Joseph M. Sienkiewicz; Joan M. Von Ahn; G. M. McFadden (2005-07-18). "Hurricane Force Extratropical Cyclones" (PDF). American Meteorology Society. Retrieved 2006-10-21. ^ "Great weather events — A record-breaking Atlantic weather system". U.K. Met Office. Archived from the original on 2008-07-07. Retrieved 2009-05-26. ^ Brümmer B.; Thiemann S.; Kirchgässner A. (2000). "A cyclone statistics for the Arctic based on European Centre re-analysis data (Abstract)". Meteorology and Atmospheric Physics. 75 (3–4): 233–250. Bibcode:2000MAP....75..233B. doi:10.1007/s007030070006. ISSN 0177-7971. Retrieved 2006-10-04. ^ a b Robert E. Hart; Jenni L. Evans (February 2001). "A climatology of extratropical transition of tropical cyclones in the North Atlantic". Journal of Climate. 14 (4): 546–564. Bibcode:2001JCli...14..546H. doi:10.1175/1520-0442(2001)014<0546:ACOTET>2.0.CO;2. ^ "Glossary of Hurricane Terms". Canadian Hurricane Center. 2003-07-10. Archived from the original on 2006-10-02. Retrieved 2006-10-04. ^ National Hurricane Center (2011-07-11). "Glossary of NHC Terms: P". National Oceanic and Atmospheric Administration. Retrieved 2011-07-23. ^ a b Jenni L. Evans; Robert E. Hart (May 2003). "Objective indicators of the life cycle evolution of extratropical transition for Atlantic tropical cyclones". Monthly Weather Review. 131 (5): 909–925. Bibcode:2003MWRv..131..909E. doi:10.1175/1520-0493(2003)131<0909:OIOTLC>2.0.CO;2. ^ Robert E. Hart (April 2003). "A Cyclone Phase Space Derived from Thermal Wind and Thermal Asymmetry". Monthly Weather Review. 131 (4): 585–616. Bibcode:2003MWRv..131..585H. doi:10.1175/1520-0493(2003)131<0585:ACPSDF>2.0.CO;2. ^ a b Robert E. Hart; Clark Evans; Jenni L. Evans (February 2006). "Synoptic composites of the extratropical transition lifecycle of North Atlantic tropical cyclones: Factors determining post-transition evolution". Monthly Weather Review. 134 (2): 553–578. Bibcode:2006MWRv..134..553H. CiteSeerX 10.1.1.488.5251. doi:10.1175/MWR3082.1. ^ Mark P. Guishard; Jenni L. Evans; Robert E. Hart (July 2009). "Atlantic Subtropical Storms. Part II: Climatology". Journal of Climate. 22 (13): 3574–3594. Bibcode:2009JCli...22.3574G. doi:10.1175/2008JCLI2346.1. ^ Jenni L. Evans; Mark P. Guishard (July 2009). "Atlantic Subtropical Storms. Part I: Diagnostic Criteria and Composite Analysis". Monthly Weather Review. 137 (7): 2065–2080. Bibcode:2009MWRv..137.2065E. doi:10.1175/2009MWR2468.1. ^ David M. Roth (2002-02-15). "A Fifty year History of Subtropical Cyclones" (PDF). Hydrometeorological Prediction Center. Retrieved 2006-10-04. ^ Christopher A. Davis; Lance F. Bosart (November 2004). "The TT Problem — Forecasting the Tropical Transition of Cyclones". Bulletin of the American Meteorological Society. 85 (11): 1657–1662. Bibcode:2004BAMS...85.1657D. doi:10.1175/BAMS-85-11-1657. ^ Velden, C.; et al. (Aug 2006). "The Dvorak Tropical Cyclone Intensity Estimation Technique: A Satellite-Based Method that Has Endured for over 30 Years" (PDF). Bulletin of the American Meteorological Society. 87 (9): 1195–1210. Bibcode:2006BAMS...87.1195V. CiteSeerX 10.1.1.669.3855. doi:10.1175/BAMS-87-9-1195. Retrieved 2008-11-07. ^ Lander, Mark A. (2004). "Monsoon depressions, monsoon gyres, midget tropical cyclones, TUTT cells, and high intensity after recurvature: Lessons learned from the use of Dvorak's techniques in the world's most prolific tropical-cyclone basin" (PDF). 26th Conference on Hurricanes and Tropical Meteorology. Retrieved 2008-11-08. ^ "JTWC TN 97/002 Page 1". Archived from the original on 2012-02-08. ^ a b "JTWC TN 97/002 Page 8". Archived from the original on 2012-02-08. ^ a b "JTWC TN 97/002 Page 2". Archived from the original on 2012-02-08. ^ "WW2010 - Pressure Gradient Force". University of Illinois. 1999-09-02. Retrieved 2006-10-11. ^ "The Atmosphere in Motion" (PDF). University of Aberdeen. Archived from the original (PDF) on 2013-09-07. Retrieved 2011-09-11. ^ "The Atmosphere in motion: Pressure & mass" (PDF). Ohio State University. 2006-04-26. Archived from the original (PDF) on 2006-09-05. Retrieved 2009-06-21. ^ "What is a TROWAL?". St. Louis University. 2003-08-04. Archived from the original on 2006-09-16. Retrieved 2006-11-02. ^ Andrea Lang (2006-04-20). "Mid-Latitude Cyclones: Vertical Structure". University of Wisconsin-Madison Department of Atmospheric and Oceanic Sciences. Archived from the original on 2006-09-03. Retrieved 2006-10-03. ^ Robert Hart (2003-02-18). "Cyclone Phase Analysis and Forecast: Help Page". Florida State University Department of Meteorology. Retrieved 2006-10-03. ^ Robert Harthi (2006-10-04). "Cyclone phase evolution: Analyses & Forecasts". Florida State University Department of Meteorology. Retrieved 2006-10-03. ^ David M. Roth (2005-12-15). "Unified Surface Analysis Manual" (PDF). Hydrometeorological Prediction Center (NOAA). Retrieved 2006-10-11. ^ Shaye Johnson (2001-09-25). "The Norwegian Cyclone Model" (PDF). University of Oklahoma, School of Meteorology. Archived from the original (PDF) on 2006-09-01. Retrieved 2006-10-11. ^ a b David M. Schultz; Heini Werli (2001-01-05). "Determining Midlatitude Cyclone Structure and Evolution from the Upper-Level Flow". Cooperative Institute for Mesoscale Meteorological Studies. Retrieved 2006-10-09. ^ a b Ryan N. Maue (2006-04-25). "Warm seclusion cyclone climatology". American Meteorological Society Conference. Retrieved 2006-10-06. ^ Jeff Masters (2006-02-14). "Blizzicanes". JeffMasters' Blog on Wunderground.Com. Retrieved 2006-11-01. ^ Richard J. Pasch; Eric S. Blake (2006-02-08). "Tropical Cyclone Report — Hurricane Maria" (PDF). National Hurricane Center (NOAA). Retrieved 2006-10-30. ^ Glossary of Meteorology (June 2000). "Zonal Flow". American Meteorological Society. Archived from the original on 2007-03-13. Retrieved 2006-10-03. ^ Glossary of Meteorology (June 2000). "Meridional Flow". American Meteorological Society. Archived from the original on 2006-10-26. Retrieved 2006-10-03. ^ Anthony R. Lupo; Phillip J. Smith (February 1998). "The Interactions between a Midlatitude Blocking Anticyclone and Synoptic-Scale Cyclones That Occurred during the Summer Season". Monthly Weather Review. 126 (2): 502–515. Bibcode:1998MWRv..126..502L. doi:10.1175/1520-0493(1998)126<0502:TIBAMB>2.0.CO;2. hdl:10355/2398. ISSN 1520-0493. ^ B. Ziv; P. Alpert (December 2003). "Theoretical and Applied Climatology — Rotation of mid-latitude binary cyclones: a potential vorticity approach". Theoretical and Applied Climatology. 76 (3–4): 189–202. Bibcode:2003ThApC..76..189Z. doi:10.1007/s00704-003-0011-x. ISSN 0177-798X. Retrieved 2006-10-21. ^ Joan Von Ahn; Joe Sienkiewicz; Greggory McFadden (April 2005). "Mariners Weather Log, Vol 49, No. 1". Voluntary Observing Ship Program. Retrieved 2006-10-04. ^ "WW2010 - Squall Lines". University of Illinois. 1999-09-02. Retrieved 2006-10-21. ^ "Tornadoes: Nature's Most Violent Storms". National Severe Storms Laboratory (NOAA). 2002-03-13. Archived from the original on 2006-10-26. Retrieved 2006-10-21. ^ "The Great Storm of 1987". Met Office. Archived from the original on 2007-04-02. Retrieved 2006-10-30. ^ "华北东北黄淮强降雨致289人死亡失踪" (in Chinese). Ministry of Civil Affairs. July 25, 2016. Archived from the original on July 25, 2016. Retrieved July 25, 2016. ^ "西南部分地区洪涝灾害致80余万人受灾" (in Chinese). Ministry of Civil Affairs. July 25, 2016. Archived from the original on July 25, 2016. Retrieved July 25, 2016. ^ George Taylor; Raymond R. Hatton (1999). The 1962 Windstorm. The Oregon Weather Book: A State of Extremes. Oregon State University Press. ISBN 978-0-87071-467-2. Archived from the original on 2006-09-07. Retrieved 2009-06-21. ^ S. G. P. Skey; M. D. Miles (1999-11-08). "Advances in Buoy Technology for Wind/Wave Data Collection and Analysis" (PDF). AXYS Technologies. Archived from the original (PDF) on 2006-10-18. Retrieved 2006-11-25. ^ Stephen Burt (April 1993). "Another new North Atlantic low pressure record". Weather. 48 (4): 98–103. Bibcode:1993Wthr...48...98B. doi:10.1002/j.1477-8696.1993.tb05854.x. ^ NOAA (2009-07-31). "State of the Climate Global Hazards August 2005". National Oceanic and Atmospheric Administration. Retrieved 2009-09-21. ^ a b Gary Padget (2005-07-31). "Monthly Global Tropical Cyclone Summary August 2005". Australian Severe Weather. Retrieved 2009-09-21.